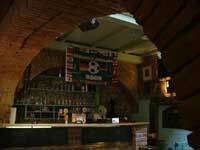 The Garage Bar and Gallery is on a side street leading away from Litomyšl’s long main square beside the town hall clock tower. 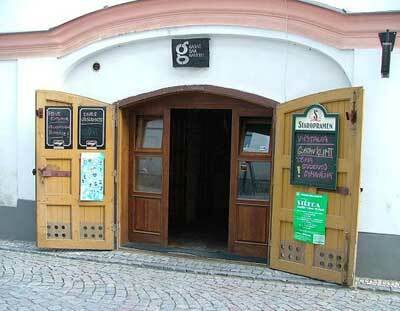 I first went into Garáž because it was the most attractive of Litomyšl’s bars from the outside. Or the least unattractive. No neon or flashing lights that would indicate the presence of gambling machines, no old drunks or underage kids stumbling around out in front, just a simple wooden-framed glass door and windows with an understated sign, a couple of beer logos, and a blackboard indicating the very reasonable prices. The interior of the bar is one big, open space, just as you would probably expect from something that was formerly a garage. Now though, there are no old car parts in sight; the space is immaculately clean and has a warm and welcoming air. A lot of natural materials have been used inside; there’s quite a bit of exposed brick in the walls, ceiling arches and the newly constructed bar counter. The rear wall is natural stone and the floor is covered in wide wooden boards, which add immeasurably to the warm and friendly feel of the bar. Along the wall opposite the bar are arranged five or six wooden tables, with enough chair and bench space for about thirty people. There’s also a generous open area near the main door, which would be big enough to provide standing space for about another twenty people. The walls above the tables are the space that is used as a gallery. I’ve seen exhibitions by local photographers, collections of football paraphernalia connected with the world cup that was in progress at the time, and student copies of Gustav Klimt paintings all displayed there at various times. So that’s the space, what about the drinks? The hot apple juice (29Kč) and the coffees (25Kč) are good to warm up with. And if you’re there in summer and need to cool down, well, they have beer, including some of the popular imported brands, like Stella Artois and some fruit-flavoured Belgians. The locally-made beers include Kelt, which is a popular thick dark beer that is usually available only in one or two pubs in each town. Most people however, seemed to be making do with the ordinary draught Staropramen for 25Kc per half-litre glass. 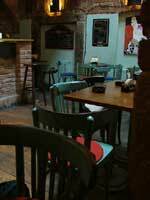 Garáž is open weekdays from 10am to 2am and on weekends from 2pm to 2am.